Whether it’s a small upgrade or a large remodel, knowing how to start a tile project can be daunting. 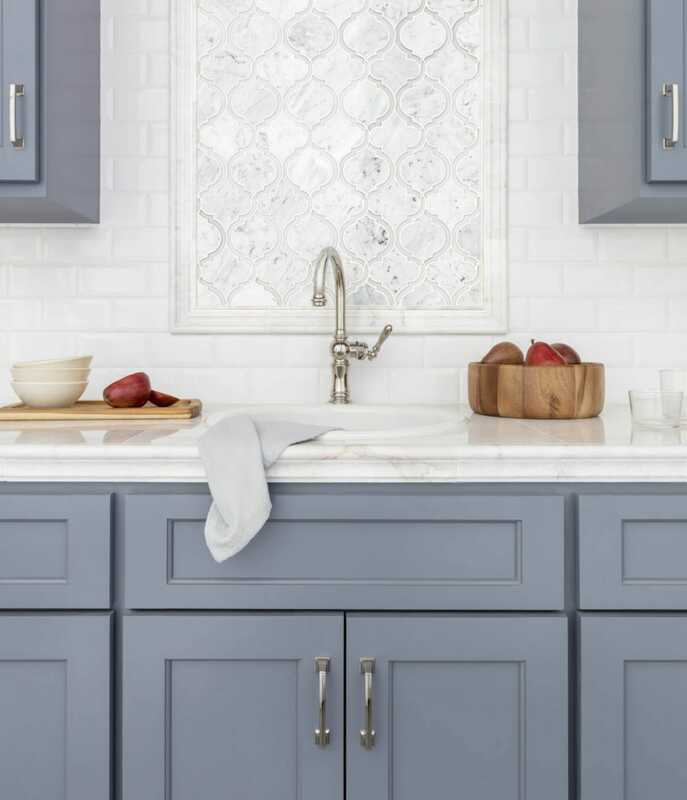 Is it best to match your tile to your cabinets or vice versa? Should you pick out a paint color first or last? Read our expert advice on how to start a project for an overview of first steps. The first step of starting a project is finding your inspiration. 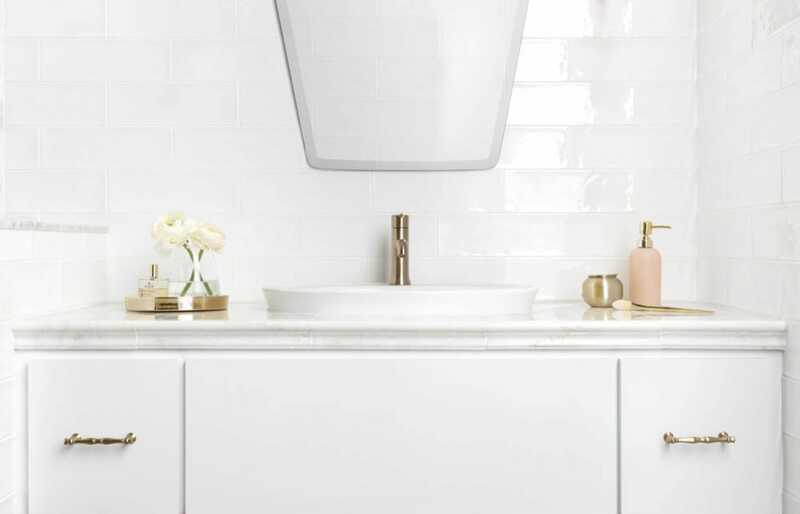 Create a Pinterest board, follow Instagram accounts of your favorite designers, search for hashtags that feature a style you love, explore thousands of photos of projects on Houzz and check out The Tile Shop’s customer inspiration gallery. Even a work of art, a fashion designer or a piece of fabric can serve as your inspiration. What commonalities do you see in the things you love? Is it a color palette? Does a common design style emerge? Just knowing what style you relate to the most can help a lot because they vary so widely, as you can see below. Whatever you choose as your inspiration, now you have a starting point that allows you to move to the next step. Take an objective look at your space and your motivations. Think about why you are tackling the project. Is it a necessary upgrade or is it about the aesthetic change? Think about how you use the space and how it is a part of your life. Is appearance or function a bigger priority for you? Consider how much time you have for upkeep and maintenance. Then consider the physical aspects of your space. Are you remodeling everything from scratch or utilizing existing cabinets or floors? If your cabinets and floors are remaining, take pictures or bring samples into The Tile Shop since you will want to coordinate with them. Be aware of other things that cannot change, like the layout, plumbing and windows. Knowing what elements are not negotiable in your new space will help you understand your options. In the two photos below, similarly colored white subway tiles are used on the walls. However, the look changes entirely depending on whether light- or dark-colored cabinets are used. This goes to show that every element of your design is important because it affects all of the others. Consider how your space will work with the rest of your home. Does the room flow right into another or is it separated from the rest of the house? 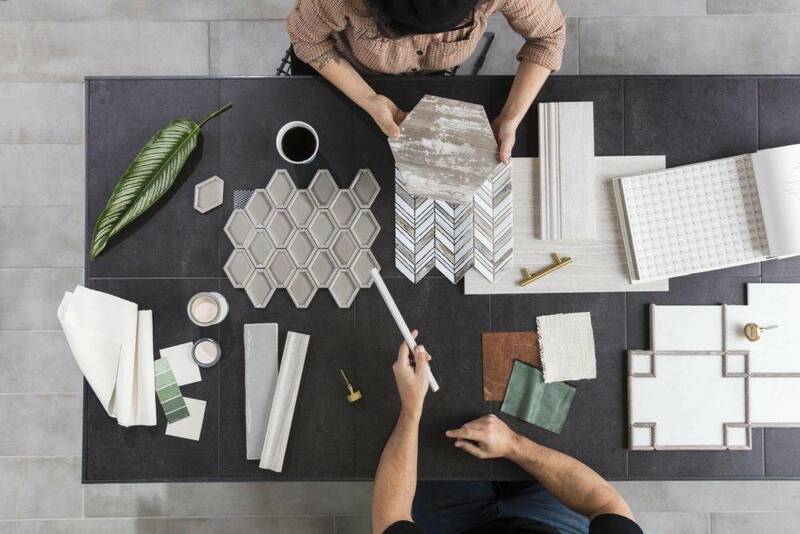 Now onto our favorite step—choosing tile! Using what you’ve learned from exploring your inspiration and assessing your space, you’re ready for the fun part. 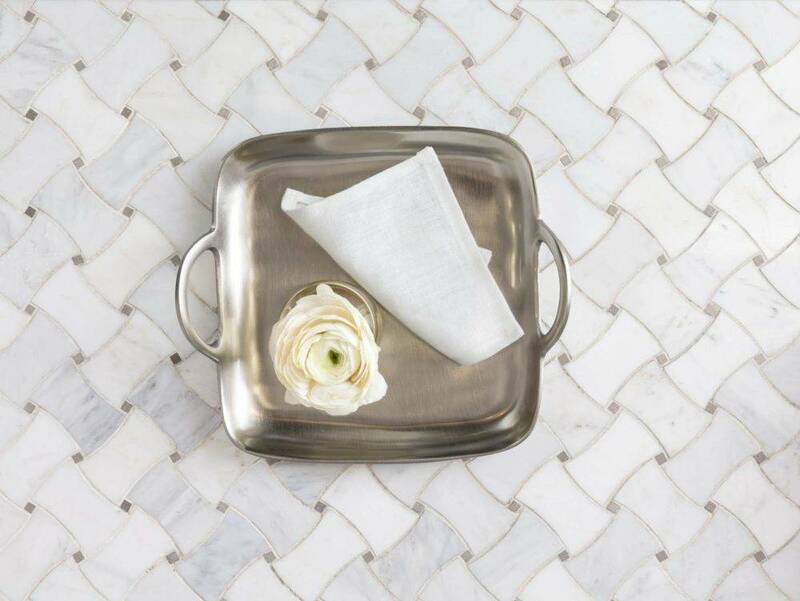 Consider both the size of your space and the size of your tile. 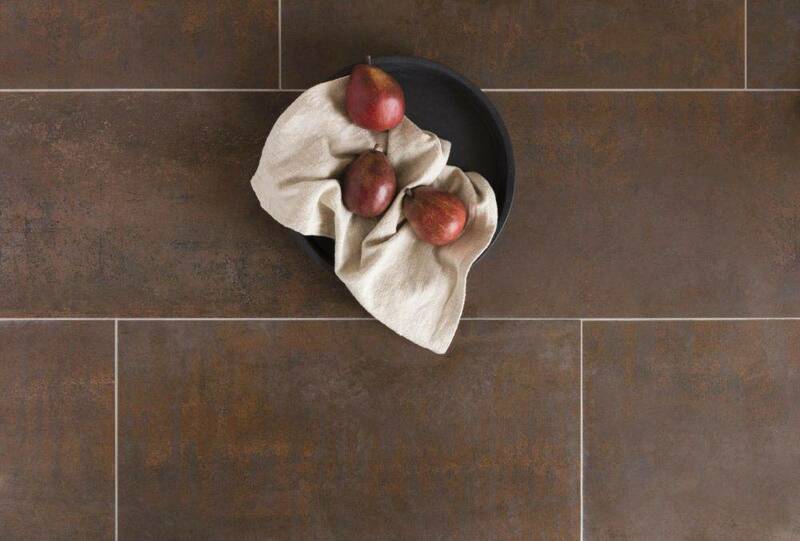 Large-format tiles can open up a space and make it feel more modern because of fewer grout joints. Conversely, a small tile, like a mosaic, will work perfectly in a small area because of the scale. As long as you bring in measurements, a store associate at The Tile Shop can help recommend a tile that is suited to the size of your space. In the two pictures below, it’s easy to see how a large tile with fewer grout lines creates a much different look than a mosaic with many small pieces. The color and style of your tile are two of the most important considerations. The style should fit into the design style you’ve established and coordinate with the rest of the space, including counter tops, fixtures and existing walls and floors. The way you play with light and dark and color will affect the look of your room, too. Textured tiles can add unique 3-D appeal to a statement wall and even become a work of art. Textured floor tiles can also be functional, creating a non-slip effect on high-traffic floors. Whether you opt for dark or light tiles, the type and amount of lighting in the space will affect the overall look and feel. Look at the tiles you’re considering under different types of light at The Tile Shop so you’re not surprised when you take them home. There is nothing like the elegant look of natural stone in your home. However, these materials require more upkeep than easier-to-care-for porcelain and ceramic that can replicate a similar look. Know how much time and effort you are able to commit to maintaining your tile before you choose a material. Your beautiful project is almost done, but it’s important not to forget about the finishing touches that complete your look. For example, is your tile floor up against another type of flooring? Transition pieces, like thresholds, curbs and wainscoting created with trim tiles, help smoothly and beautifully go from one material to another, whether from a floor to a floor, a floor to a wall or tile to paint. 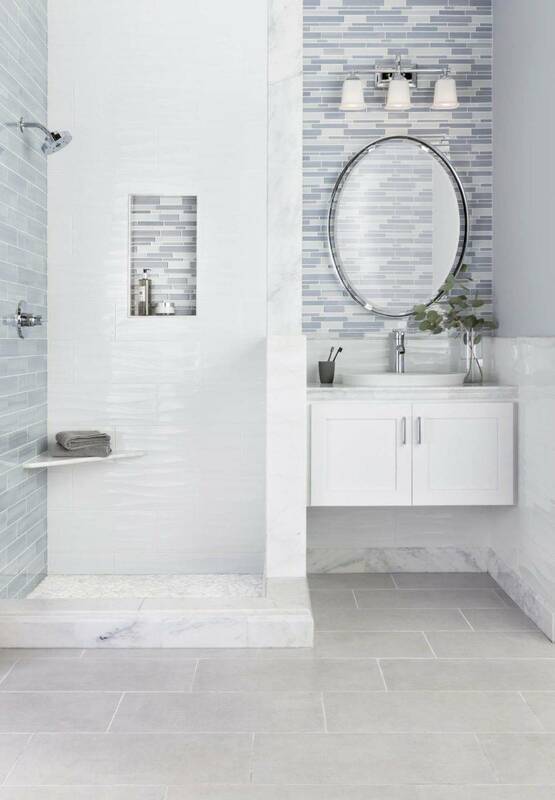 These trim pieces elegantly transition from both the shower to the floor tile and between the floor and wall tiles, tying all the greys and whites together in harmony. Similarly, your entire look will be elevated when you layer trim pieces into your design. It’s the finishing touch that takes the design to another level. Read our post on layering to learn more about how to use trim, accessories and other finishing pieces. 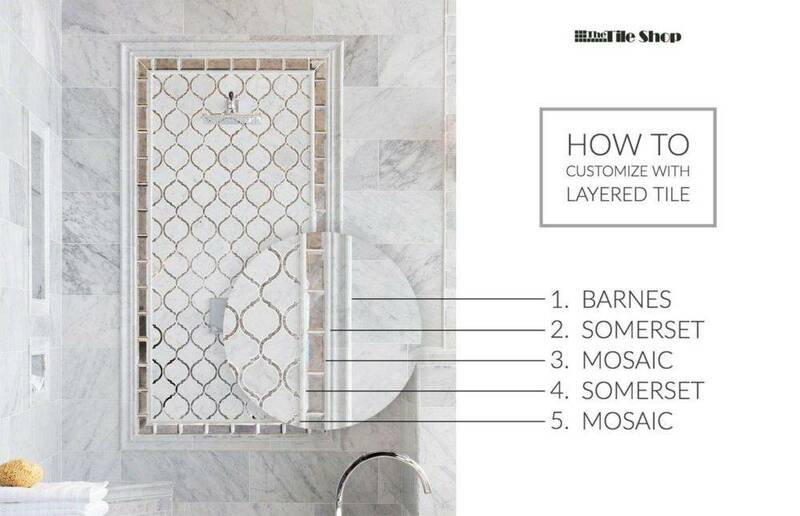 Tip: Select your desired tile collection, then add trim and profile pieces to your design for a customized look. The single most important part of your project is making it your own. You can do this with paint (there are thousands of colors of paint, so we always save this for after you’ve chosen tile), accessories and adding your own personal decorative and creative touches to your room. After all, if it feels like you, it’ll feel like home.